Cupcakes 'n Daisies: Back to Hill Country . . .
Back to Hill Country . . . So now that Hallowe'en 1904 is done it's back to one of my class projects from the Buggy Barn Quilt Show. 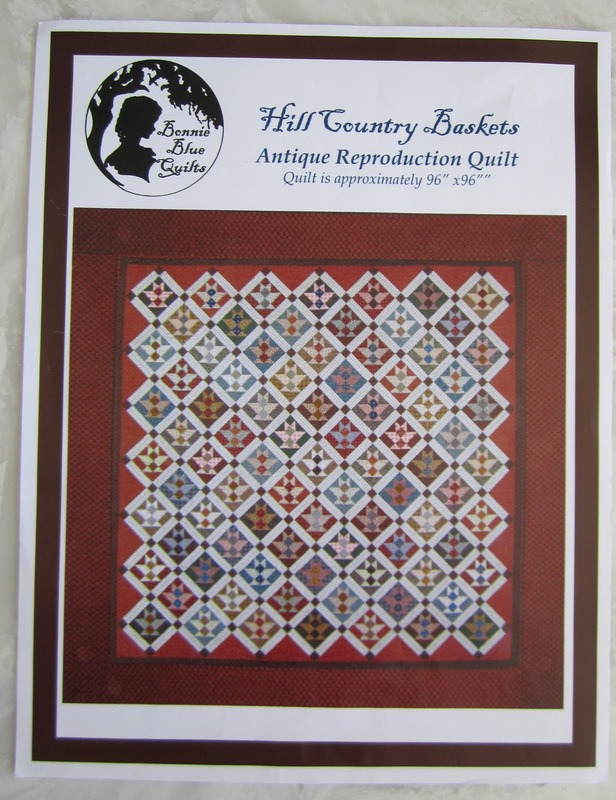 I love this Paula Barnes pattern, Hill Country Baskets, but then, I've never met a basket quilt I didn't like. The fabric provided in the kit for the class just didn't appeal to me, except for the sashing fabric, so I thought about substituting Hemming House by Brannock and Patek for Moda. These are the two blocks I made in class. In the end I decided this fabric wasn't really me either, but sometimes trying something a little different is a good thing, the family has red and goes well with the gray and black sashing fabric so I'm hoping it will all work out in the end. I'm working with a fat quarter bundle and have no yardage to speak of so I either need to come up with a pieced outer border or track down some Hemming House. This line is a couple of years old and so far the pieces that I've found online haven't been my more favorite prints from the family. Someone gave me a tip to look on ebay, and I may have found something, I've never bought fabric on ebay! So far so good considering I don't have an end plan, I'm just piecing baskets. I am really liking the look of these blocks. Good call on the fabric, even though you didn't like it at first. Thanks for sharing another fun project. I'll enjoy watching. Maybe if you post a piece of the fabric for which you're looking, someone out in blogger land might have it in their stash. It's worth a try. I love these blocks! I've bought fabric on ebay and haven't had a problem. As with any purchase, look at seller reviews. I do agree that the original fabric just didn't work. The two sample blocks have a background that is too busy. Are you familiar w/ Quiltshops.com? 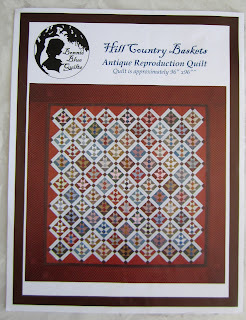 This website is a group of lots of independent quilt shops, and it has a very nice search engine. You can type in the name of the fabric you are looking for, and if any of the shops has it, a thumbnail will pop up. I use it fairly often. Good luck finding your fabric! Such cute baskets! I feel your pain about tracking down out of print fabrics - such a challenge! By the way, did you ever do anything with that lot of 19th century reds that you bought for the ill-fated Paprika? I love these little blocks. I remember that fabric line and have used some as well but sadly don't have enough yardage left to help you out! 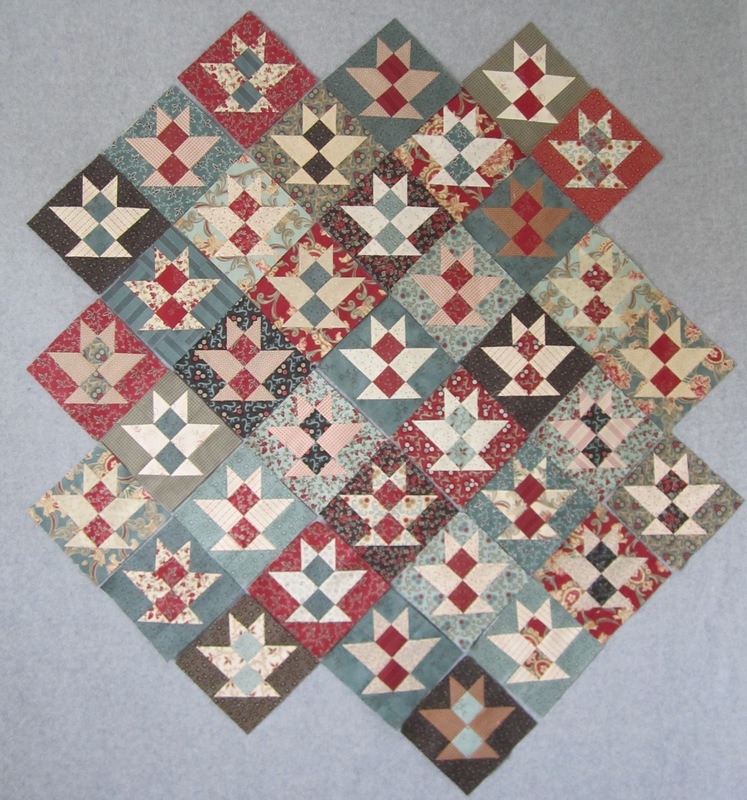 I love this quilt - I have made a handful of the blocks in pinks and browns, but my fabric choices were a little too busy and I put it away. 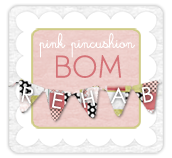 Your post makes me want to re-visit that project! 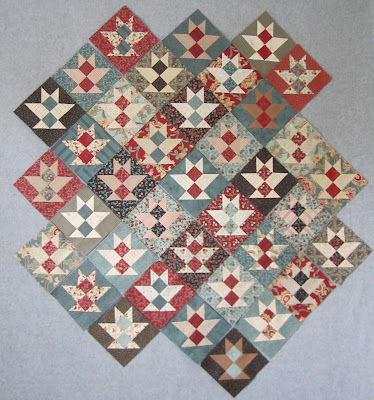 Love the quilt pattern and the fabrics you've chosen look pefect. Hope you find the extra fabric you need soon. I like your fabric choices better than what was in the kit. Good luck on the fabric hunt! Ebay is good and so is Etsy. If there is a particular print you want, try Missingfabrics.com too. I have a love for basket blocks also! Those two blocks you made look very happy in the large group! I love how the center squares pop out in the block! Ah...nothing like sewing basket blocks AND going on a treasure hunt for more fabric...enjoy! I've never met a basket block I didn't just love either. They are sort of the red& white - you just can't have too many!!! Love your choice of fabric and don't you just love going with a fat 1/4 bundle?! Makes everything nice & neat. I have purchased a few pieces of fabric from eBay, when it was a must and never a problem - in most cases if you look at the seller, they are shops on line, and not from someone's stash. What fun to just sit and sew up baskets. Are you cutting as you go along? Some times I will cut up then match up what I want together, and place the pieces on paper plates, then just sit and sew with all the little pieces ready to go. Have a super day!! I buy a literal ton of fabric from eBay. Older collections, newest precuts that haven't been released to other stores yet, great sale items, etc... I get a bit of a rush from winning my bids! :) On a quick search right now for 'Hemming House fabric', there are 4 different sellers who have items. I have bought from 3 out of the 4 that are listed. I liked them all. 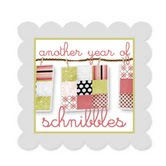 "Be Creative Quilting Fabric" (seller id is shirbrew) is very good and they seem to have a large variety of this fabric collection at the best overall price as well right now. I wouldn't hesitate to order from her. Best of luck!! I love basket blocks, and these are darling. Hill Country Baskets, a Finish! Are you counting , I am!! No Sewing but plenty of Fun . . . . Happy Eat More Pie Day! How I spent my football Sunday . . . When black is not black . . .
Hill Country Baskets . . . .
BOM Rehab - MoP . . . Seven Snowmen . . . .
A Funny Thing Happened . . . .